Over on YouTube Corrosive from channel SignalsEverywhere has uploaded a new video in his series on Digital Amateur Television (DATV). The new video shows us how to use a transmit capable SDR like a LimeSDR or PlutoSDR to transmit DATV with a free Windows program called DATV Express. Over on YouTube Corrosive has uploaded a new tutorial video showing us how we can demodulate DVB-S DATV (Digital Amateur TV) on a Windows PC with SDRAngel. DATV is a mode used by hams to transmit and receive digital video, and SDRAngel is a multiplatform SDR software platform that supports multiple SDRs such as the RTL-SDR, HackRF, PlutoSDR, LimeSDR and more. SDRAngel comes with a built in DATV demodulator, but it is necessary to install the FFMPEG video decoder yourself. Corrosive's tutorial shows where to download the decoder, and how to install it into SDRAngel. He then goes on to show how to use SDRAngel to begin receiving and demodulating a DATV signal. We note that in a previous post Corrosive also showed in another video how to transmit and receive DATV with a LimeSDR and a modified $20 DVB-S receiver. 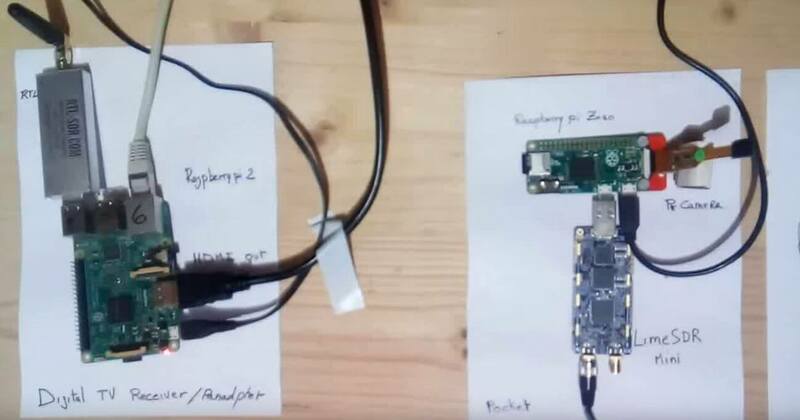 Over on YouTube user Evariste Okcestbon has uploaded a video showing his simple pocket DATV system that consists of a LimeSDR running on a Raspberry Pi Zero transmitting live camera images via DATV which is received by an RTL-SDR running on a Raspberry Pi 3. If you didn't already know, DATV stands for Digital Amateur Television and is a digital mode somewhat similar to digital over the air TV signals that can be used by hams for transmitting their own TV signals on the ham bands. The LimeSDR Mini is a $139 US transmit and receive capable SDR that is currently crowdfunding and available for pre-order on Crowdsupply. It is expected to ship at the end of February 2018. Description of a minimal Digital Tv chain : Transmitter and Receiver. Evariste is also the author of Rpidatv which allows you to transmit DATV directly from the GPIO pins of a Raspberry Pi without the need for any transmit capable SDR.